Featuring the eye-watering free bromoto display font. 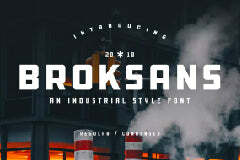 Download this typeface from the original source of Fadli Ramadhan Iskandar. Easily amaze your audience with this fancy font and make your graphic designs pop up from the crowd.